uncertainty can lead to significant improvements in diagnostic capability. theory, information measures, machine learning, maintenance, transformer diagnostics. several attempts at developing software tools. see [1,2]. There have also been efforts aimed at model-based reasoning approaches, e.g. under the uncertainty inherent in realistic data. single observation or measurement which definitively indicates impending failure. imprecision and perform effective diagnosis. implementation of large knowledge bases. mathematics and leads to a rule-based representation for expert system development. this chapter will focus on this problem. requirements for a model of uncertainty are presented. mathematics with emphasis on the lesser known fuzzy information aspects is then given. representation of equipment monitoring and diagnostics. transformer diagnostics in order to clarify the developed approach. gases are measured. High concentrations of certain gases are indicative of fault conditions. supplemented with other tests, e.g., an analysis of insulation paper based on furfural levels. analysis (although it could easily reduce the accuracy of the final result). 2. Every relation and uncertainty value can be found individually. assumptions ensure that inputting knowledge to the system can be done incrementally. Condition B may also be some intermediary value which is propagated to other rules. insulation paper, oil moisture content, etc.) and indicated equipment condition. associated with this measurement or acceptable range. 3. Importance of the measurement in determining the condition of the equipment. are propagated among rules in the reasoning process. extensive treatment of fuzzy mathematics can be found in [14,15]. maximum functions . For example, the framework of Dombi  is used in this work. a generalization of probability measures such that the additivity restriction is removed. where φ is the empty set. supporting or refuting specific hypotheses. provide a common representation for information. non-empty intersection) explain a hypothesis. evidence which is unreconcilable (evidence on mutually exclusive sets). These measures provide an assessment of the quality of information in the basic assignment. discussion on the transformer diagnostic techniques should refer to [2-3,6-11]. X1: The transformer has an electrical fault. X2: The transformer has a thermal fault. X3: The transformer paper insulation has significantly aged. X4: The transformer is operating normally. although there appears to be strong evidence that a fault exists. (i) First compute the K value for tests 1 and 2. (ii) Compute the combined evidence values. (iii) Again, compute K for the combination of the tests. (iv) Now compute the evidence values for the combination of the tests. type but that would need to be backed up by a test indicating the presence of a fault. sense of the quality of data and conclusions. calculations illustrate the relation between uncertainty and information. discussed next before continuing with computational aspects. sets is the rational assignment of membership values. similar fuzzy sets, e.g., "high methane concentration." in measurement values should be reconsidered. sensitivity is to build redundancy into the rule base. indicates this is a monotonically increasing function. engineer for the fuzzy set "high methane concentration:"
Figure 1. Fuzzy set "high methane concentration"
as a "conservative" estimate on the probability and a plausibility value is chosen as a "liberal"
reliability of a rule is established. More sophisticated methods are discussed in section 6.
measure representation of ignorance is all conclusions have plausibility one and belief zero. example, the resulting plausibility must be less than the initial plausibility. does not guarantee consistency among rules if the rule conclusions Bk are related. assignments must be as consistent as possible. methods must operate on 2n sets. a transformer is both operating normally and experiencing arcing faults. with a large number of possible conclusions. required to access the all relevant data from the data base. (ANNs) incorporate very powerful methods of learning from data. problem, the ANN approach faces one major difficulty: the acquisition of interesting data. first in terms of evaluating performance and second in terms of improvements. 3. The fuzzy membership functions were redefined based on the process in section 5.
of all cases was obtained. 4. Information measures for the systems in step (2) and (3) were computed. on acceptable ranges for measurements. In general, the information measures are affected by tuning of the parameters. measures improved for more typical data which included easy to classify cases . is, the measurements would be inputs and the various equipment states would be outputs. which the conclusions are known. tests. This data can provide a convenient test bed for analyzing an expert system approach. equipment is highly reliable; therefore, there are relatively few field failures of equipment. gas solubility relations is the foundation for DGA. 1. ANN can implement fuzzy membership functions. of little use in this work. approach the performance of the fuzzy set methods. The ANN is trained to match the expert system performance. show promise in that it requires the least amount of failure data for training. 1. Uncertainty in acceptable ranges for measurements is modeled by fuzzy sets. 2. A systematic approach for establishing membership functions is described. condition is modeled by a fuzzy measure. assignment is consistent with the fuzzy measure axioms. information. Again, this is a global computation. determine appropriate tests to clarify analysis when there is conflicting information. a means of tuning fuzzy parameters in order to improve performance. Associates were very helpful in gaining a further understanding of transformer testing. Bibliographic Survey," IEEE Transactions on Power Systems, Vol. 4, No. 4, Nov.
Model-Based Monitoring,'' M.S. Thesis, MIT, Cambridge, MA, June 1990. S. Tanimoto, Elements of Artificial Intelligence, Computer Science Press, 1987. Systems,'' IEEE Transactions on Power Systems. (in press). Meeting, 92 WM 243-6 PWRD, New York, Jan. 1992. Systems Computation Conference, 1987, Lisbon, pp. 715-721. Delivery, Vol. 8, No. 3, July 1993, pp. 1638-1646. Diagnostic and Maintenance Techniques, Berlin, Germany, April 1993. Applications to Power Systems, France, Sept. 1994, pp. 363-370. Other Oil-Filled Electrical Equipment in Service, First Edition, 1978. Intelligence, Vol. PAMI-7, No. 3, May 1985, pp. 260-283.
and Systems, 40, 1991, pp. 431-450. Numerical Recipes in C, 2nd. ed., Cambridge University Press, pp. 517-565. IEEE Expert, Winter, 1987, pp. 81-90. 1993 NAPS, Washington, D.C., Oct. 1993, pp. 125-129. 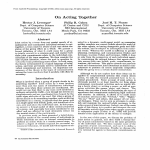 Among Rules,'' Proceedings of the 1989 Workshop on Tools for AI, Oct. 1989, pp 360367.